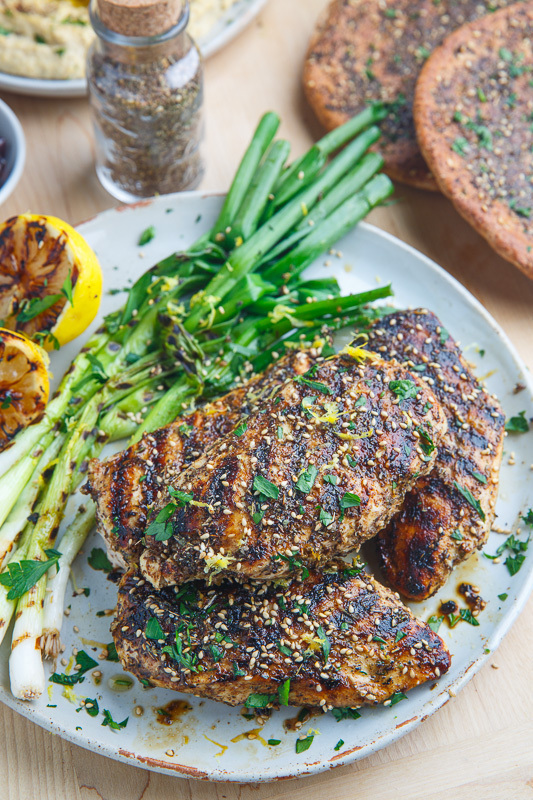 Za’atar, lemon and garlic marinated chicken breast grilled to smoky perfection! Looking to do some summer grilling? 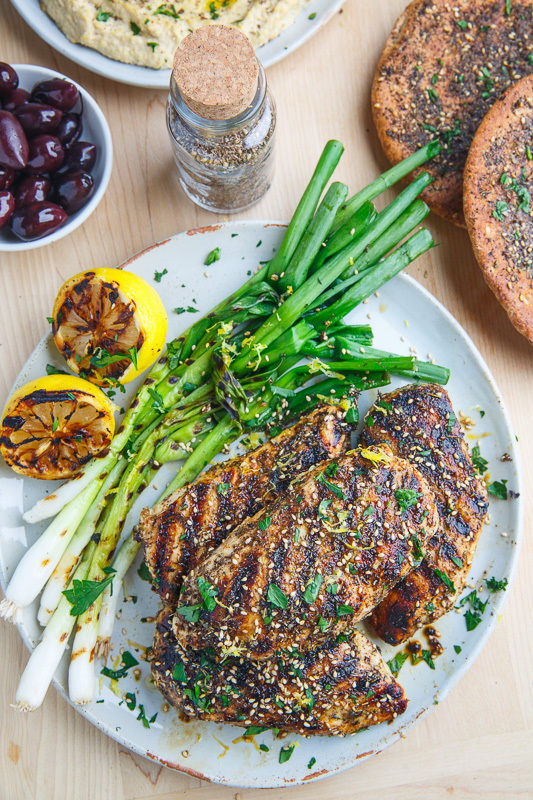 How about this za’atar grilled chicken? Za’atar is a Mediterranean spice blend that includes thyme, oregano, sumac and sesame seeds; it’s just packed with flavour and it makes for one tasty marinade for grilled meats! The za’atar is really the star of the show here but it need some oil along with a healthy dose of lemon juice and garlic to turn it into a super tasty marinade for the chicken! 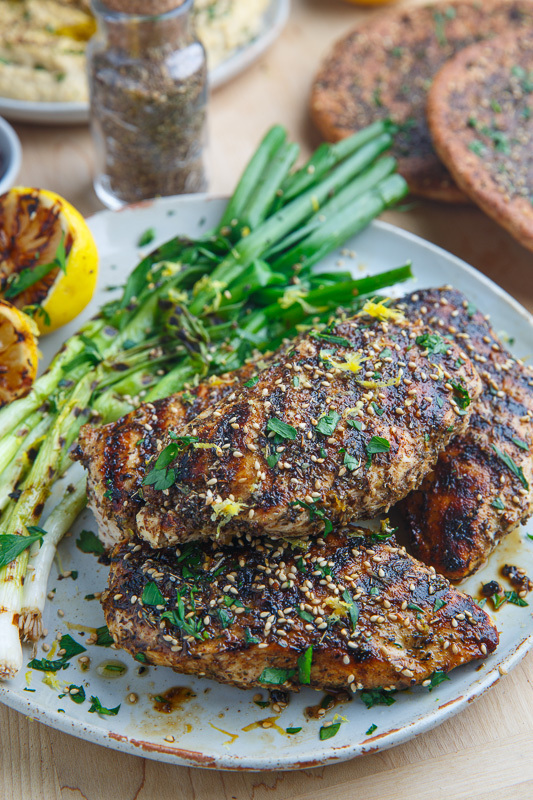 You just need to marinate the chicken in the za’atar, lemon and garlic marinade and grill it up! It’s that simple! 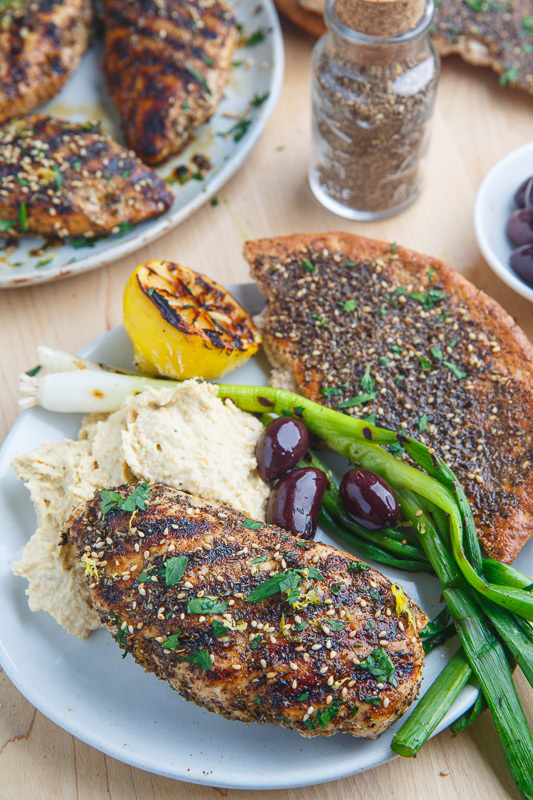 In the photos I served the za’atar grilled chicken with grilled green onions, kalamata olives, za’atar grilled naan and a fresh batch of homemade easy hummus for a nice light, healthy and tasty summer meal! Marinate the chicken in the mixture of the remaining ingredients for 30 minutes to overnight. Cook over a grill heated to medium-high heat until cooked, about 3-5 minutes before setting a side. Great way to use za'atar! One of my favorite spices!! I need to try this flavorful grilled chicken asap! I need to get my hands on some za'atar! So happy that za'atar is finally getting its day in the sun! As I just mentioned in the Za'atar post, I was just introduced to this spice last year and ended up buying a bag of it on Amazon. When I run out, I'll start making my own with your recipe. This chicken dish looks great, so I will definitely be trying it soon. Thanks! Drool worthy pictures. The chicken has been grilled with just the right smoky texture and browning. I am not a fan of green onions, so I’d sub it with fried shallots, maybe add some red pepper to my hummus as well. A perfect meal idea for weekends or when I have friends over. Thank you for this recipe inspiration. True zaatar herb is a rare find here in the US, even in ethnic food stores. As the blend quality greatly varies and comes with little to no real zaatar herb plus fillings like peanuts. I’ve started buying my zaatar and sumac from an online store, and if links are allowed in the comments, I’d recommend http://www.eatzaatar.com. Can I cook this in a grill pan? As a NYC apt dweller, I don’t have access to an outdoor grill. Yes you can! I make this indoors on a grill pan when the weather out side is not so nice! Enjoy!